“Pretty as a peacock, twelve-year-old Leela had been spoiled all her life. She doesn’t care for school and barely marks the growing unrest between the British colonists and her own countrymen. Why should she? Her future has been planned since her engagement at two and marriage at nine. Leela’s whole life changes, though, when her husband dies. She’s now expected to behave like a proper widow: shaving her head and trading her jewel-toned saris for rough, earth-colored ones. Leela is considered unlucky now, and will have to stay confined to her house for a year—keep corner—in preparation for a life of mourning for a boy she barely knew. When her schoolteacher hears of her fate, she offers Leela lessons at home. For the first time, despite her confinement, Leela opens her eyes to the changing world around her. India is suffering from a severe drought, and farmers are unable to pay taxes to the British. She learns about a new leader of the people, a man named Gandhi, who starts a political movement and practices satyagraha—non-violent protest against the colonists as well as the caste system. The quiet strength ofsatyagraha may liberate her country. Could she use the same path to liberate herself? One of my favorite things to do at the library, if I have a bit of time, is to randomly pick a shelf and then browse the books on it for something that looks interesting. In this case, I was wandering through the YA section and looked at the Fiction, R-T authors (my library has YA divided up into general fiction, genre fiction and then series). 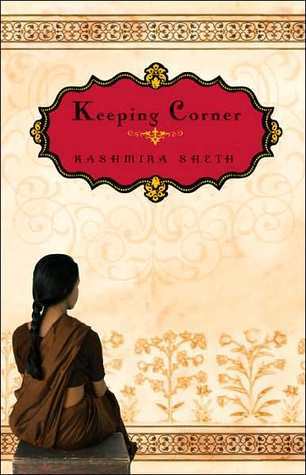 Something about Keeping Corner caught my eye and I am so glad that I picked it up to read. It is probably one of the more intriguing books that I have read in the last year. I’ll admit that my knowledge of India’s history is rather lacking – I know very little about it, because it never really intrigued me to study it. Of course, everyone knows who Ghandi was (or at least the vast majority of us do). Keeping Corner takes place as he was starting his long-journey of activism – he wasn’t too widely known in the more rural areas of India (where Leela and her family lived), but was in the cities (where Leela’s brother lived). But while Ghandi is mentioned frequently through-out, Keeping Corner is more the story of Leela. A young girl and soon to be child-bride, Leela is living her life as expected – waiting for her marriage to occur, so she can move in with her new husband’s family. But that all changes drastically when her soon to be husband is bitten by a snake and dies. Now she is expected to mourn for a year, in a tradition known as “keeping corner” – isolated from the world she has grown up in, not allowed to express joy, limited in interactions. I don’t know if I would have had the strength to survive what Leela did for a year – it took mental acuity that I don’t know that I possess (or many people today may possess). She faced the loss with bravery, and while at times she acted like the young girl she was (only 12) – she also displayed at times, the maturity of someone far older. The author wrote Leela’s story in a way that would be engaging to both Young-Adults and adults who were reading the book. It has made me want to explore and read more about India’s customs, when it comes to death, weddings, births etc. although I haven’t found any books yet that I can recommend. Overall, I gave Keeping Corner 4 stars and I can’t wait to find more books by the author. 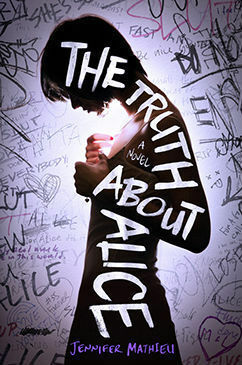 I’ll admit that the quirky-ness of the cover is what drew me to this book when I saw it posted in my Goodreads group. And then reading the quote about the one thing in life you need is a good hairdresser (which I am of course paraphrasing) – I really wanted to read it. However, while I enjoyed it, I think I was a bit disappointed with how it played out. I’m not saying the book was bad, it just wasn’t quite what I expected – which is why I ultimately gave it 3 stars. But i am interested to see what the author writes in the future, because she will def. be an author to watch. Unfortunately, he has the wrong look (short, plump, Brillo-pad curls), he has the wrong interests (Broadway, chorus violin), and he has the wrong friends (Spencer, into Eastern religions, and Mary Ann, who doesn’t shave her armpits). And Chuck? Well, he’s not gay; he’s dating Becky, a girl in chorus with whom Justin is friendly. In detention one day (because he saw Chuck get it first), Justin comes up with a perfect plan: to allow Becky to continue dating Chuck, whom Becky’s dad hates. They will pretend that Becky is dating Justin, whom Becky’s dad loves. And when Becky and Justin go out on a fake date, Chuck will meet up with them for a real date with Becky. Chuck’s bound to find Justin irresistible, right? What could go wrong? One thing I have loved about listening to books nominated for the Audie Awards is that it made me find authors that I had never before read and narrators I had never before listened to. And in the case of My Awesome/Awful Popularity Plan, I got a double dose – with a new author, plus getting to listen to his narration/interpretation of his characters. I got to also listen to the fabulous narration by Megan Hilty (who stars in my favorite, although now cancelled show, SMASH – boo hoo). I think I spent almost the entire time chuckling at Justin’s antics. He was the epitome of the high school geek. I have to wonder how much of the book was based on the author’s experiences. There seemed to be a sense of realism that doesn’t always appear in books (that, or he never truly left his teenage years…). To say where the plot put forth by Justin was insane, would be an understatement…I couldn’t wait to see what would happen next. It was like listening to a comedy of errors as the school-year progressed. Rudetsky managed to pack nearly a full-year of high school trials and tribulations into a relatively short book (I mean, the audiobook was just over 5 hours long). I enjoyed the various narrators who participated in the book. I thought that the director found the right blend of youthful innocence and snarky humor in their voices. I also appreciated the fact that at the beginning of the book, the various narrators were introduced and the characters that they were portraying was mentioned. This really helped me be able to put a voice to a character rather than all of the various narrators blending together. This, to me, is something that I have discovered to be important in multi-narrator books. I gave My Awesome/Awful Popularity Plan a solid 4 stars and I know that I will be seeking out more books by the author in the future. I typically don’t play much attention to books that win the Newberry Award (or similar), but after listening to Moon Over Manifest, I am intrigued to check out more of them (I think the last one I remember reading was The Giver – Lois Lowry). My purpose for picking up this book…I was looking for an audiobook that had 2 or more narrators that my library had available immediately…and thus, I grabbed Moon Over Manifest to listen to (yes, I know, a hugely scientific method of picking which book to listen to next). My initial reaction/thoughts, when I heard the name of the main character, was Abilene – I wonder what the etomology of that name is, since it isn’t one you normally hear (and the last i heard it was in The Help). According to Think Baby Names, the origins of the name is one of Hebrew origin and it is believed to have been derived from the hebrew word for grass – which now that I think about it kind of fits the character of Abilene. She was truely a girl that I would love to sit down and have a meal with to talk – the whole idea of her existing (along with her father) in a state of perpetual motion moving from place to place. When it came to the narrators, the only one of the three that I had previously listened to – Kirby Heyborne – and when I saw that he was one of the narrators I jumped at the narration. I had also heard good things about Cassandra Campbell, although I had never listened to anything done by her. I was also a bit confused at the beginning because Overdrive listed Justine Eyre as the main narrator, but the audiobook listed and stated Jenna Lamia – so I thought at the beginning that maybe they were a pseudonym of each other, but I found out I was wrong. I have no real complaints about the narration – I thought that all three of the narrators fit their roles well and added to the depth/texture of the story. If I was to make one comment, I think that Kirby Heyborne was a bit under-used. He, specifically, was the voice of Ned, one of the boys from Manifest who was fighting in WW1. While I think his voice was great for. However, some of the other flash-backs I think could have used his voice – especially since they were told from the perspective of a young boy. While a bit nit-picky, that was my biggest complaint about the overall narration. I was a bit conflicted overall with what to give Moon Over Manifest – I was wavering at a 3.5, but not sure if I should round up or down and now sitting down and thinking about it – I think I am going to go with the round-up option. This is the type of book, while written for a young-adult audience, can be enjoyed by pretty much anyone who enjoys historical fiction. Mia Winchell appears to be a typical kid, but she’s keeping a big secret—sounds, numbers, and words have color for her. No one knows, and Mia wants to keep it that way. But when trouble at school finally forces Mia to reveal her secret, she must learn to accept herself and embrace her ability, called synesthesia, a mingling of the senses. It was funny, when I was talking to my friend Naomi about the book I was currently reading (this one), she made the comment back that I find the weirdest/interesting books to read and how did I do it (of course, there was various other friendly banter in the convo, but that was the gist of it). And I came to realize that is true – so many of my book recommendations come from lists off goodreads and they are ones I never would have picked up before. 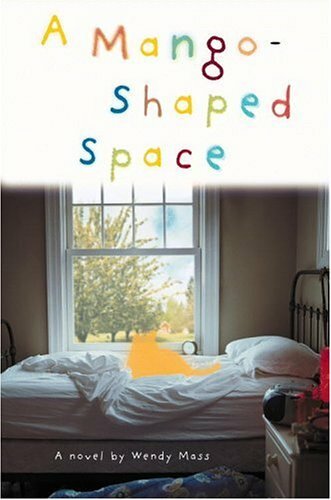 Case in point, I found A Mango-Shaped Space on a thread called, the best books you never would have read except for this challenge – talking about the Seasonal Reading Challenge, I have done for nearly two years now (and it was the first time I have looked at that thread). The thing I loved the most about this book was the pure simplicity of it – while so many YA books now a days are so complicated with family issues; or world building – Mia’s life was about as close to perfect as you can get, except for the fact that she sees colors in everything around her – not in the way that most of us see colors (trees are green etc), but rather that words have colors – her name and those around her; numbers; dates in history. I vaguely remember learning about synethesia when i was taking psychology in college, but haven’t read/heard much about it since then – so I was intrigued. You could tell that the author had really done her research and managed to balance telling about the disease through the characterizations; but also just letting the story play out. I have to admit that I did see the ending coming relatively early on, but then, since it was a YA book that doesn’t surprise me – they normally are fairly telling if you can pick up on the clues. I would probably recommend that parents preview the end before letting their kids read because of one thing that happens (death is a theme through-out and something that parents should be aware of because all kids react differently). I’ll definately be looking for more books by the author in the future. 4 stars overall.